Living the Dream... 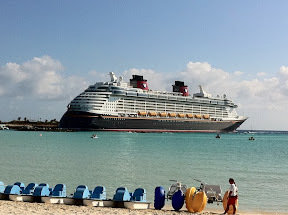 The Disney Dream | Daddy's in Charge? 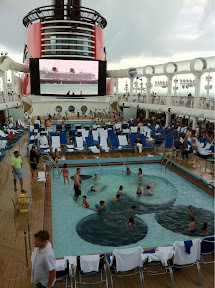 Four days aboard the Disney Dream has been just that, a dream. This boat is the third of the Disney fleet with the Fantasy debuting some time next year being the fourth. 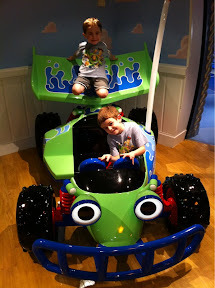 For those of you that are fans of Disney, which most parents of small kids are, this ship is everything that you would expect. From the entertainment, to the food, to the characters Disney goes all out. 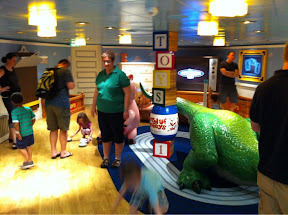 There is certainly something for every age on this ship, although I would not recommend parents without kids partaking in this cruise. I will have a much more extensive review including guest bloggers in a future post, but here are some quick observations about this four day trip. 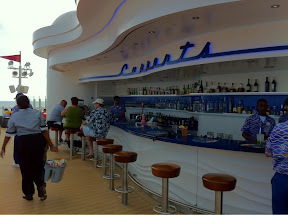 I guess I have been spoiled a little bit by going on a good number of cruises including the Oasis of the Seas, the gigantic megaship offered by Royal Caribbean, but I was a little bit disappointed by the public spaces offered on this cruise. 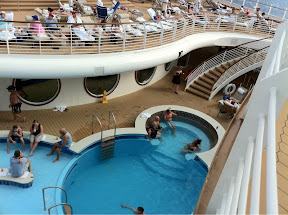 One day at sea convinced me that the family pool area should have been much bigger. My youngest son got very frustrated by not being able to practice his belly flop. Take this as what it is because every other kid had fun although they were right on top of each other. 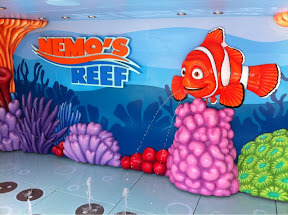 The pool itself IS larger than that of the other Disney cruise ships, and this is made possible by the addition of Nemos Reef, a shaded spray area for kids under eight years old. This is a great improvement over the other ships as there really was no place for the un-potty trained kids to play in the water. The main attraction of the boat, for parents and kids, is the kids club, the Oceaneers Club and Lab. While my oldest wished there was a slide like that on the Disney Magic, spoiled little son of mine, they have updated this area to include Andy's room from Toy Story, a Monsters Inc. room and a spot called Pixie Hollow where the kids can do arts and crafts. That is only half of the space as my kids didn't even venture over to the Lab side, where mote fun awaits them. I don't think that there is a kid in the world that wouldn't have fun in there. I wish they would have put as much thought into the adult areas. After dropping the kids at the Club there were many places for the adults to hang out including my favorite bar on the boat Currents. There is something about hanging out outside and drinking a cocktail that is much more appealing than being cooped up inside. This by the way is the BEST place to watch the fireworks on Pirates night, no crowds like there are at midship where everyone gathers to jostle for a viewing position. As far as the inside bars, let's be honest the wife will get cold outside, we tended to gravitate towards a bar called Skyline where the scenery changes every 15 minutes giving you a view of five different cities around the world, a pretty cool idea. There is a sorts bar for the dads if what you want to watch something on ESPN, Disney of course. Luckily for me there was a Syracuse basketball game on TV. My only complaint was that it was not in HD, I guess being out at sea I should feel lucky that there was TV at all, so I shouldn't complain. Overall though I thought the spaces were small and somewhat misplaced, though the service was great and they had the beer that I wanted, so who really can complain? The boat itself is very tastefully done but seems a bit tight. The hallways are very narrow and the layout can be quite confusing but something you can easily figure out. There are three family restaurants and the best is by far Animator's Palate where you get to spend your evening with the characters from Finding Nemo. I still don't completely understand how Turtle Talk with Crush works but you can have a conversation with the animated Turtle while you eat your dinner. It really is amazing and something kids of all ages will love, of course you have to get them to eat. 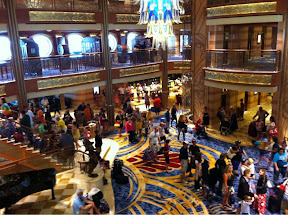 The bottom line is while there were some things that bothered me about this ship you cannot go wrong on this cruise. Some of the design layouts left a little to be desired but I was really nitpicking trying to find things wrong on this ship. What do you look for when you go on a cruise? Food, check. Entertainment, check. Things for the kids to do, CHECK, CHECK, CHECK. Those are three things that Disney does better than anybody, and I haven't even mentioned their private island which is BY FAR the best in the business. I would assume that you are looking into this trip as a FAMILY and not some whacko grown up Donald Duck fan (sorry if anyone takes offense to that statement, not meant to make anyone mad.) Any family would have a wonderful time on this ship, I know mine did. By the way there are characters on this boat as you would expect, they are not everywhere and don't come to dinner with you. You can take cute pictures with the kids and be done with it, much like we did. 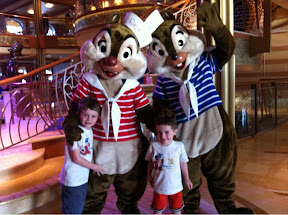 This boat even got my son Carter to pose with the characters, something he has never done. 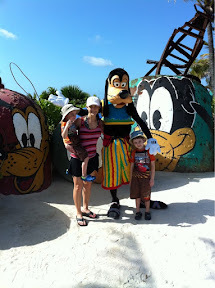 I will have a much more detailed review including entertainment and island stops as my wife and son would like to comment as well about this trip. 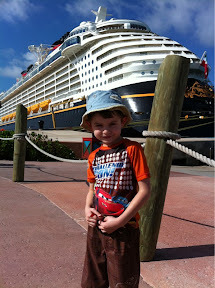 Here is a story about my son Tyler and a trip we had aboard the Disney Magic 4 years ago. An almost tragic day turned us into even bigger Disney fans.